Taman Negara National Park was established in Malaysia in 1938/1939 as the King George V National Park. It was renamed to Taman Negara after Independence, which literally means “national park” in Malay. The total area of Taman Negara is 4,343 km². 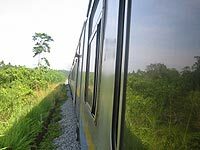 From the north-eastern corner of Malaysia runs a train line right through the rain forest until it reaches Malaysia's other train line that connect Singapore-Kuala Lumpur-Bangkok. The train is also called the jungle train. 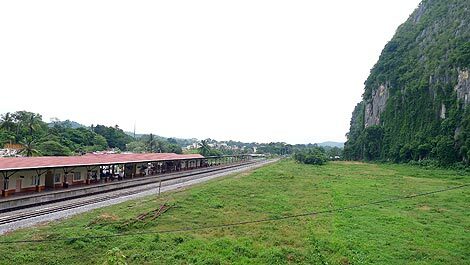 Here is a story of 2 days on the train from Kota Bharu until Gemas with a stopover in Kuala Lipis. 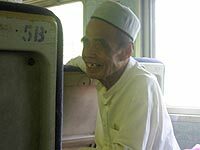 We got up early at 4.30am in Kota Bharu and took a taxi to the Wakaf Bharu train station which was a 15 minute drive from Kota Bahru. I tried to buy a ticket the day before but the woman at the counter said that tickets are only available at the train station on the same day. When we arrived at the train station the counter was still closed so we took a seat and waited. About 30min before the train arrived (yup, I guess we were too early) the counter opened up and we bought 3 tickets which was RM 32.40 all together. That just reminds me of the documentary I watched yesterday about the Orient Express from Singapore to Bangkok with ticket prices of 1600 Euro to 3000 Euro. Anyway, we got in the train and sat down in a basic 3 rd class car with ceiling fans. After a while I decided to explore the rest of the train. As I fought my way through durian and other local fruits that were stored in between the cars, I found one car that was a bit better equipped and air-conditioned so we moved our things here. However, the a/c was set so low that we had to get extra-clothing out of the backpack to keep us warm. Meanwhile it was day-light already and we passed by paddy fields and villages and the environment turned more and more into jungle. At some of the bigger stations the train stopped for about 20min to wait for the on-coming train since there is only a single track between the stations. At times the jungle is so thick that it touches the train on both sides and it feels like the train is eating its way through the rain forest. The handful of backpackers left the train in Jerantut which is the gate to Taman Negara, the national park. 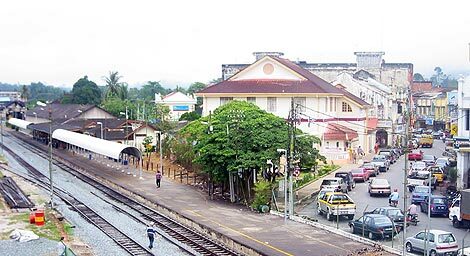 We got out of the train in Kuala Lipis after about 8 ½ hours in the train. 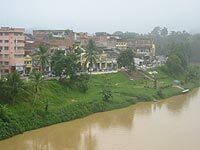 Kuala Lipis is a small town with a colonial past as the capital of Pahang. Now it is quite sleepy and there is not much too do. 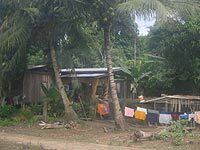 Taman Negara and Kenong Rimba State Park are close by and tours can be booked there. We just used it as a stop over as we wanted to get to Melaka the next day. Our train left at 2pm the next day and we used the morning for a walk. It had been raining until the early morning so the temperature was still pleasant. There were less people on the train then yesterday where a lot of locals used the train to commute between neighbour towns and villages. The further we got to Gemas (todays last stop) the emptier the train got. In the end there were merely 5 people in the train. This 2nd part of the train ride was not as scenic as the day before as the jungle slowly turned into oil palm fields. When we arrived at 8.30pm it was already dark and started to rain. In Gemas the train line insects with the line between Singapore and Kuala Lumpur. 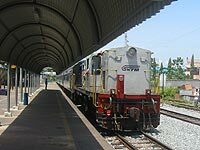 However; the next train wouldn't leave before the middle of the night but we wanted to get to Melaka anyway. The was no buses or taxis anywhere that could take us to Melaka so we sat down in the Chinese run cafe at the train station and sipped a few Teh Tariks. Mostly Indians sat at the tables and had tea and ate Nasi Lemak for dinner. As I ran out of ideas how to leave from here I ask the guy running the cafe if he knows how to get us to Melaka. He said he that there were no more taxis or buses at this time. Luckily, one of his friends, an Indian drug enforcement officer, would be willing to take take us to Tampin. From there we should be able to take a bus. We waited another hour before the friendly Indian Man took us with his car (fancily decorated on the inside with Ganesh and other Hindu symbols) on the 30min trip. Along the way he explained with a loud strong voice about the drug situation in Malaysia (favourite phrase: "you have to be very be careful"). After the very interesting ride we arrived in Tampin. By now it was already quite late so we decided to be lazy and took the more expensive (RM 40) option of taking a taxi to Melaka. Shortly before midnight we arrived at the Eastern Heritage guesthouse in Melaka.